If a laminate appeared on the floor in the house, you must pay tribute to the good taste of the owner and hostess. Due to the beautiful appearance, excellent performance, he is able to create a warm and cozy atmosphere in the home. However, without proper care laminate in the apartment will not last long. And it turns out that not all cleaning products can be used to clean this flooring. 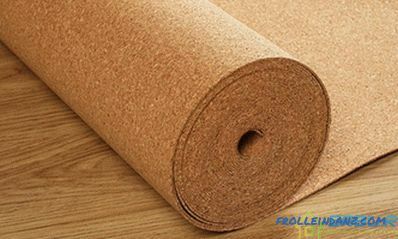 The ideal temperature for laminated coverings from 18 ° С to 25 ° С. Valid humidity is from 40 to 70%. These indicators are the most optimal: chipboard materials will not swell. But on the other hand, a low level of humidity at high temperatures will cause shrinkage. This is called the work of air conditioning and floor heating systems. Because of this, it is recommended to use special humidifiers when the heating is on. This will prevent the destruction of the base flooring. It should be noted that the laminate is divided into several classes, which determine the strength of the finished product. 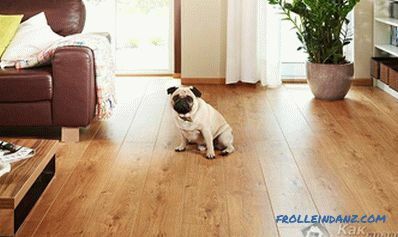 Accordingly, choosing the right care for laminate, take into account what class a particular coating. 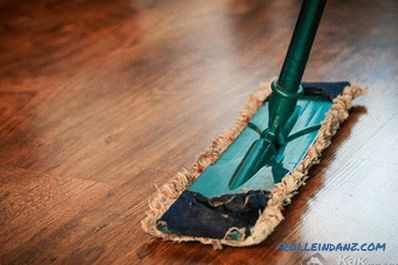 In general, the laminate floor is unpretentious, but when choosing a wet cleaning, there are a few nuances to consider. To wash the laminate, you need clean water and a rag. Rag must be well squeezed. It should be wet, so that water does not flow from it. If during cleaning the water is accidentally spilled on the floor, to eliminate the formed puddle, it is necessary to thoroughly squeeze a rag and quickly collect water, then wipe the surface with a dry rag. It is unacceptable to use a large amount of water during wet cleaning. If the laminate is poured, the coating will swell in the area of ​​the joints due to leaked water. As a result, will have to buy and lay a new laminate. That's the whole essence of wet cleaning: there are no tricky and difficult moments. Chemical detergents today filled the counters of specialty stores. Chemistry for laminate is no exception. It is important to be careful here, because with improper handling of detergents, the laminated coating can not help but harm. It is not necessary to use chemical detergents for each cleaning. It is enough to do it once a month! To a greater degree the need to use detergents will directly depend on the degree and intensity of contamination of the floor. If the room is passable, then, most likely, the laminate gets dirty quickly. It is unacceptable to use detergents that contain abrasives. They may scratch the laminated surface of the product. Properly used and cleaning brushes. It is forbidden to use hard sponges or brushes, which will leave marks on the floor. What should I do if during the repair process paint or glue accidentally got onto the laminate? How to eliminate pollution quickly and effectively without negative consequences? 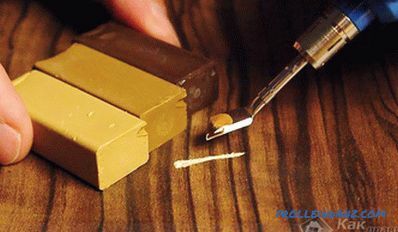 Take some ethyl alcohol or acetone. First, the selected substance is applied to the stained area. After a few minutes everything should be washed off with clean water (wet rag). In most cases, the method allows you to eliminate the stain with a 100% result. If fresh stains from coffee, berries or tea are noticed on the floor, a slightly damp cloth can easily eliminate the contamination. With a dried stain without detergent will not cope. But buy those products that are directly intended for washing the laminated coating and apply them strictly according to the instructions specified by the manufacturer. Traces of bicycle rubber or colored pencils can be easily removed with a nylon dry cloth. If, with careless handling, ink or nail polish spilled on the floor, then only acetone or ethyl alcohol would be needed. These spots are the most difficult. To restore shine, use a special tool that restores appearance. If it is indicated on the detergent bank that it is for parquet, then in no case can it be used for laminate, since such coatings have a different structure and are also produced using different technologies. One of the good old cleaning methods is a vacuum cleaner.When it comes to using a washing vacuum cleaner, laminate manufacturers do not recommend its use, although some models of vacuum cleaners can be used. After cleaning with a washing vacuum cleaner, moisture remains on the surface, which should be immediately wiped off with a dry cloth. But why do the work twice, when you can use a regular vacuum cleaner, no problem removing dust or small fragments of dirt? 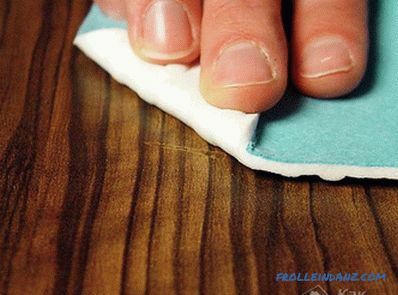 This is the most effective method of cleaning laminate. In this case, no divorces will definitely remain. With proper care, the laminated coating can last from ten to thirty years, as the manufacturer prescribes. 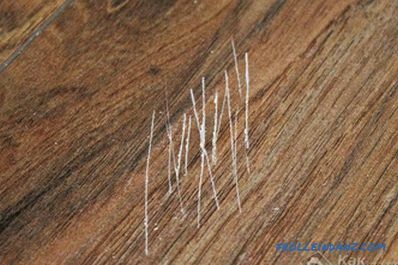 During transportation furniture from one corner of a room to another is often scratched or frayed stripes on the floor. An eraser will be required to remove these contaminants. They simply erased the resulting attrition. If the scratches or scuffs are old, then you should prepare a solution with soda, which must be stirred with water to a pasty state. Soda paste will soften the "tired" areas of the laminate and restore it. You can use vinegar, which eats away all dirt from any surface. 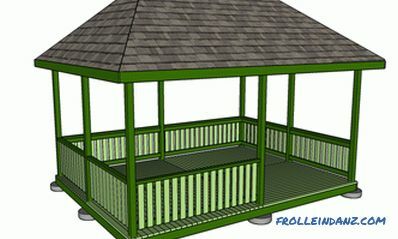 A wax coating will significantly impair the appearance of the coating. You can also get rid of it with vinegar. The required proportion: four liters of water to one cup of vinegar. This compound disinfects the floor and makes it clean. 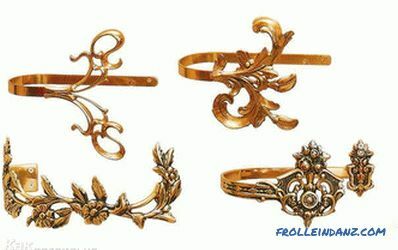 If the wax coating is old, then it can be warmed with a hairdryer, after which the problem area should be wiped. 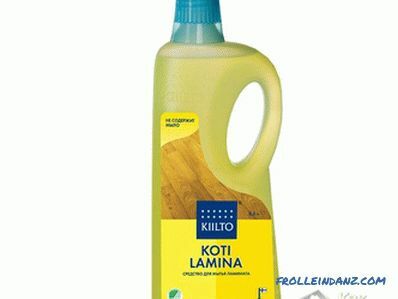 There is an original solution - cleaning laminate with a steam cleaner. However, not every coating class can be subjected to such cleaning. For example, class 21, 22, 23 will not withstand steam loads. 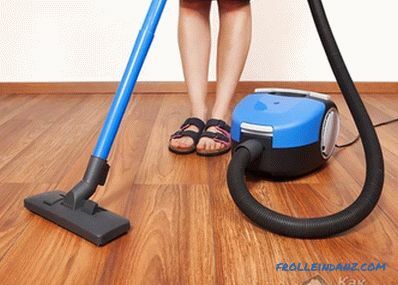 Laminate 33 and 32 classes can be exposed to moisture, so the steam cleaner is permissible to use. However, pay attention to the nuances. A microfiber cloth needs to be folded in several layers, and the steam supply is not pressed continuously, but by periods. As a result, the cleaning will resemble the process of moping the floors, from which the stains remain. But here when using the steam cleaner of stains you will not see. 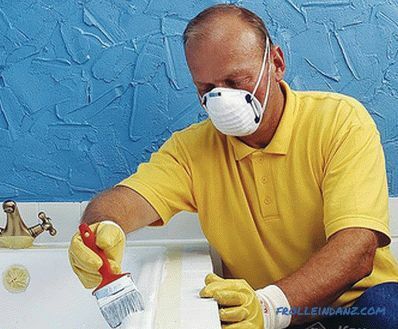 The result will not take long, as the surface of the laminate will be perfectly clean.